In looking at what has shaped our approach to land, music, and art on the geologic upthrust plateau of Tippet Rise, Cathy and I realized that the land was too vast, too timeless, for conventional structures or art forms. In exploring what kind of structures or sculptures might work on Tippet Rise, we looked in many directions, factual and fanciful. We looked at the music of the spheres (the sounds planets and stars make when they spin in their orbits), the mathematical ratios which make music agreeable, the shaped rooms that convey music more sympathetically, and how those shapes might translate ancient systems of geometry and astronomy into contemporary art and architecture. We went back to the beginnings of human morphology to rethink the principles of hearing and seeing and how they might apply to the designs at Tippet Rise. For instance, we are built from the same chemicals which are found in stars. We have some ingredients which are in fact only found on asteroids, so we are, each of us, starmen; we are parts of sky. Thus we respond innately, chemically, to the hidden gears which control the planets, and which also control us. What we think of as emotions often are simply chemical reactions, as scientists are fond of pointing out: love is supposedly caused by a combination of three neurochemicals: phenylethylamine, norepinephrine and dopamine. Long-lasting love is caused, they say, by oxytocin and serotonin. We all hope that we are better than the chemicals which make us robots for love and which, when you add them up, come to around 99 cents. We have 37 trillion molecules in us, so we are more complex than the multiverse, which has “only” 150 billion galaxies. There are both scientific and emotional roots to our chemical predilections. For instance, where sound originates shapes our perception of it. Planets and asteroids are kept in orbits by spinning and creating a note, a frequency. We can listen to these frequencies, as our government does. When an asteroid loses its spin, like a top slowing down, it falls out of orbit and becomes a meteor. Asteroids have to maintain their harmony, that singular sensation, in the chorus line of the asteroid belt in order to stay in space. Music is simply our own imitation of these planetary frequencies. The music of the spheres, or musica universalis, was understood by the Mayans, Incas, Egyptians, and more recent philosophers and scientists like Plato, Pythagoras, and Kepler to be the fabric which kept space structured. This correlation of space and hearing is only one facet of the golden ratio. Perfect “human” spaces cannot be magnified many times and still sound the same. There is in fact only one unique size which works. Through trial and error over the millennia, bad spatial dimensions were abandoned, and shapes with an enveloping sound retained. When you speak in such rooms, it sounds like you’re singing. Your voice is naturally amplified, the way it is with a reverb mic in a rock concert. Spaces like the Temple of Solomon, the inner chamber of the Parthenon, the Haydnsaal at the Esterhazy Palace in Hungary, the Empiresaal at the Esterhazy Palace in Austria, the Mozarteum in Salzburg, Borromini’s Oratorio of St. Phillip Neri, were all built according to these ratios, and are prized today by musicians for their immense emotional contribution to whatever is played in them. Haydn, Mozart, Bach and Beethoven wrote specifically for these spaces, which provided the sound they expected to hear. The spaces worked - and this is the essential point - because they were sized proportionately to the human ear. Because these halls are shorter than a Great Hall (double their size), they allow for stronger and shorter reflections from the rear which reinforce the sensation of envelopment. These reflections travel immediately to the performance area without creating echoes. With fewer seats they can have a long reverberation, and overall their acoustics are intimate, clear, reverberant, loud, enveloping, and rich. With the advent of larger halls to house larger orchestras due to the civic pride of communities created by increasing global prosperity, the ear was left behind. What Alban Bassuet refers to as “the human ratio” was replaced with an architecture which abandoned the discoveries of the past in favor of new adventures in sound, which were innovative but invariably disappointing. The inner sanctum of close-up sound was abandoned for the grand hall of balls and epic soirées. The deep knowledge of the past was jettisoned in favor of novelty. Only now have we gained some distance from the industrial revolution and its two inventions: a middle class anxious to better the salons of aristocrats, and cost-effective iron skeletons which could support enormous halls. Only now can we appreciate the perfection of older halls without feeling we need to improve on them or compete with them. We have the perspective to realize that we gave up classical perfecction for the larger Romantic orchestra of Berlioz, often involving more than a hundred musicians and, as in Beethoven’s Ninth or Mahler’s Eight Symphonies, a chorus sometimes numbering in the hundreds. The conductor Leopold Stokowski re-orchestrated simple works by Bach where dozens of instruments played notes formerly given to a single instrument. We left the human aspect of music behind, as the starchitect phenomenon and advances in construction gained precedence over what simply sounded better. Young audiences today, however, demonstrably find the old, formal halls intimidating and distant, preferring smaller spaces like Le Poisson Rouge in New York City, which was the former jazz club, The Village Gate, and which is now sold out nightly, while attendance at larger venues languishes. So, gradually, music spaces, enlarged for financial reasons, to enhance the status of communities, are shrinking, due to human reasons, back to their original and more effective shapes. By abandoning ancient amphitheaters and classically proportioned chambers, by disconnecting architecture from metaphysics, from the earth, we have short-circuited the natural connections whereby music gets its power. In Greek mythology, Hercules killed the sons of earth, the Giants, by lifting them off the earth, which they needed to touch to maintain their power. This is why concerts in natural outdoor environments are so popular: because they connect with nature. To use a parallel from the science of making rum: sugar cane embodies the aquifer from which it springs. And so the best rum is made from water immediately below the sugar cane. We ourselves are born, like the Giants, from earth, to which we ultimately return. Music, architecture, and art, like rum, are more physically connected when made of the same cloth as their environment. Ancient dwellings like bories in the Cro-Magnon area of France, the standing stones and cromlechs of prehistoric Britain, or even Swiss chalets, all acknowledge this connection with the earth. The poet John Hollander has written a book, The Untuning of the Sky, where he discusses the loss of the celestial mosaic where Seventeenth Century poetry gradually became unglued from its metaphysical roots, to its great disadvantage. C. S Lewis, in his last book, The Discarded Image, similarly notes the loss of the metaphysical synthesis, the harmonious, ordered model of the universe which linked the soul to its surroundings, giving it enormous resonance. In acknowledging the place of the land in society, in agricultural communities - ideally in all communities, - we would like to recognize as well the need for ancient architectural formulations in the creation of the contemporary soul, to demonstrate how the deep resonance of musical spaces, and of art outdoors, is a necessary juxtaposition for the yin and yang, the jumble of influences which must all be present for the harmony of an area. Mark di Suvero cites J. W. N. Sullivan’s groundbreaking work, Beethoven: His Spiritual Development, in stressing the need for the human presence to be a factor in modern science. Di Suvero’s chosen materials, iron and steel, are an ironic commentary on how the industrial revolution has distanced us from the tuning of the skies. His passion for the great metaphysical poet, John Donne, feeds his grief over our breaking with the vast structures which used to define us. The fractal angles of di Suvero’s Beethoven’s Quartet or Proverb summon up the ice spars of Caspar David Friedrich’s Sea of Ice, where the emanations of the Roman Catholic monstrance, an icon symbolizing the sun shooting out of the sky in lines of light, coincide with the jagged masts of a ship lost to the ice, human tragedy twisted into a grotesque homage to celestial design. Di Suvero’s pieces are more contained, more modern, but they contain in them the anguish of the frozen sun, the traces of atoms in an atom chamber, the hidden rays of structures lost to a chaotic society. They mourn the loss of the Pythagorean harmony, the loss of our contact with the sky, while they provide the sympathetic link to the land through the vibrations of steel: Beethoven’s Quartet, for example, can be played with a mallet, evoking Jubal, whose brother was a blacksmith. Jubal observed that hammer strikes produced various pitches on the anvil according to their weight, and subsequently realized that musical instruments could be made to do the same thing. Using Pythagoras’s experiments to provide musical ratios, Jubal developed the cithara, and is considered the father of music. Stephen Talasnik similarly invokes the cities of the future drawn by Piranesi and the ordered proportions drawn by da Vinci, as in his Vitruvian Man, in organizing his own fractal structures. Order and chaos constantly replace each other as engines of the world, like a black and white snowball rolling downhill - now black, now white. The world we intuit is layered with meanings and denials, and it all depends on the specific day as to whether we discover or lose ourselves in it. Patrick Dougherty evokes the earthen architecture of bories, of primal cultures, the way Picasso adapted tribal art from Papua New Guinea to revitalize the relevance of art to society. We find in Dougherty’s intricate aboriginal huts a resonance which links us to more authentic civilizations, societies without ironies, where art wasn’t signed but belonged to the tribe. This sincerity frees the soul from ego for a closer engagement with the earth from which his structures derive their primal identity. At the same time, Dougherty references with simple sticks the proportions of classic Roman architecture, such as Donato Bramante’s 1502 Tempietto di San Pietro outside Rome, so that instinctual prehistoric weavings combine with deeply-wrought mathematical precepts in his work. Antón and Débora Garcìa-Abril’s structures evoke the pre-history of Stonehenge. The very process of their construction involves digging in the earth, pouring concrete molds, and raising those earthenwares into the third dimension of height. Their fabrication evokes older ways of building with the land. As Anton’s father, the great composer Garcìa Abril, uses traditional forms of music in modern modalities, the Abrils return to pre-history to rethink ways of living with the earth, and in the earth. The names of their “stones” evoke the cromlechs and barrows of ancient times: dolmens, megaliths, portas and cairns. 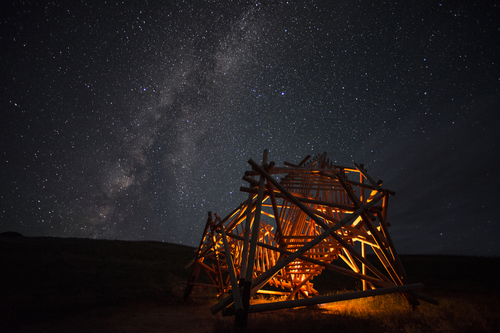 We hope at Tippet Rise to elucidate over the years these correspondences between great science and great art. We hope that intellectual curiosity will flourish under our immense sky; the star-struck landscape of the Beartooth mountains is as good a mirror as any high-altitude observatory to magnify our minute observations of the great traditions that surround us.